Great for the animal lover, dog shaped headband is made from 14 pt. high density white paper board, liquid laminated for a high gloss finish. 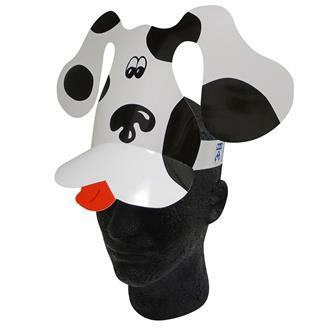 Dog headband provides highly visible imprint are for your custom message. Ideal for the Humane Societies, rescue organizations or any animal lover. Quick turn, just ask! Shipped flat with minimal assembly. Imprint Area : Bill of hat is 1 1/2" H X 6" W.Band is 1" H X 8" W.